This article is about the accent. For the food, see Scouse (food). Scouse (/skaʊs/; also, in academic sources, called Liverpool English or Merseyside English) is an accent and dialect of English found primarily in the Metropolitan county of Merseyside, and closely associated with the city of Liverpool. The accent often extends through neighbouring areas and across the Liverpool City Region, including Birkenhead and the wider Wirral Peninsula, as well as Ellesmere Port, Chester, Runcorn and Widnes in Cheshire and Skelmersdale in Lancashire. The Scouse accent is highly distinctive, and has little in common with those used in the majority of neighbouring regions. The accent itself is not specific to all of Merseyside, with the accents of residents of St Helens and Southport, for example, more commonly associated with the historic Lancastrian accent. North of the Mersey, the accent was primarily confined to Liverpool until the 1950s when slum clearance in the city resulted in migration of the populace into new pre-war and post-war developments in surrounding areas of Merseyside. South of the Mersey, Scouse spread very early to Birkenhead in the 19th century but much later to the rest of the Wirral. The continued development of the city and its urban areas has brought the accent into contact with areas not historically associated with Liverpool such as Prescot, Whiston and Rainhill in Merseyside and Widnes, Runcorn and Ellesmere Port in Cheshire. Variations within the accent and dialect are noted, along with popular colloquialisms, that show a growing deviation from the historical Lancashire dialect and a growth in the influence of the accent in the wider area. Inhabitants of Liverpool can be referred to as Liverpudlians, Liverpolitans or Wackers but are more often described by the colloquialism "Scousers". The word "scouse" is a shortened form of "lobscouse", whose origin is uncertain. It is related to the Norwegian lapskaus, Swedish lapskojs and Danish labskovs and the Low German Labskaus, and refers to a stew commonly eaten by sailors. In the 19th century, poorer people in Liverpool, Birkenhead, Bootle and Wallasey commonly ate "scouse" as it was a cheap dish, and familiar to the families of seafarers. Outsiders tended to call these people "scousers". In The Lancashire Dictionary of Dialect, Tradition and Folklore, Alan Crosby suggested that the word only became known nationwide with the popularity of the programme Till Death Us Do Part, which featured a Liverpudlian socialist, and a Cockney conservative in regular argument. Originally a small fishing village, Liverpool developed as a port, trading particularly with Ireland, and after the 1700s as a major international trading and industrial centre. The city consequently became a melting pot of several languages and dialects, as sailors and traders from different areas, and migrants from other parts of Britain, Ireland and northern Europe, established themselves in the area. 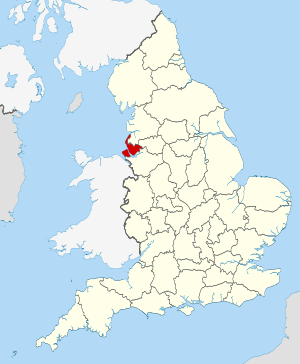 Until the mid-19th century, the dominant local accent was similar to that of neighbouring areas of Lancashire. The influence of Irish and Welsh migrants, combined with European accents, contributed to a distinctive local Liverpool accent. The first reference to a distinctive Liverpool accent was in 1890. Linguist Gerald Knowles suggested that the accent's nasal quality may have derived from poor 19th-century public health, by which the prevalence of colds for many people over a long time resulted in a nasal accent becoming regarded as the norm and copied by others learning the language. The period of early dialect research in Great Britain did little to cover Scouse. The early researcher Alexander John Ellis said that Liverpool and Birkenhead "had no dialect proper", as he conceived of dialects as speech that had been passed down through generations from the earliest Germanic speakers. Ellis did research some locations on the Wirral, but these respondents spoke in traditional Cheshire dialect at the time and not in Scouse. The 1950s Survey of English Dialects recorded traditional Lancastrian dialect from the town of Halewood and found no trace of Scouse influence. The phonetician John C Wells wrote "The Scouse accent might as well not exist" in the context of The Linguistic Atlas of England, which was the Survey's principal output. The first academic study of Scouse was undertaken by Gerald Knowles at the University of Leeds in 1973. He identified the key problem being that traditional dialect research had focused on developments from a single Ursprache (e.g. West Saxon in the work of AJ Ellis), but Scouse (and many other urban dialects) had resulted from interaction from an unknown aggregate of Ursprachen. He also noted that the means by which Scouse was so easily distinguished from other British accents could not be adequately summarised by traditional phonetic notation. The phonemic notation used in this article is based on the set of symbols used by Watson (2007). Monophthongs of Scouse (from Watson (2007:357)). /eː/ has a huge allophonic variation, but the quality of other vowels is less variable. Diphthongs of Scouse (part 2, from Watson (2007:357)). /ɛʉ/ has a considerable allophonic variation. As other Northern English varieties, Scouse lacks the FOOT-STRUT and TRAP-BATH splits, so that words like cut /kʊt/ and pass /pas/ have the same vowels as put /pʊt/ and back /bak/. However, some middle-class speakers may use a more RP-like pronunciation, so that cut and pass may be /kʌt/ and /pɑːs/, with the former containing an extra /ʌ/ phoneme that is normally not found in Northern England English. Generally, speakers are not very successful in differentiating between /ʊ/ and /ʌ/ or /a/ and /ɑː/ (only in the BATH words), which often leads to hypercorrection. Utterances such as good luck or black castle may be /ˌɡʌd ˈlʊk/ and /ˌblɑːk ˈkasəl/ instead of RP-like /ˌɡʊd ˈlʌk/, /ˌblak ˈkɑːsəl/ or Scouse /ˌɡʊd ˈlʊk/, /ˌblak ˈkasəl/. Speakers who successfully differentiate between the vowels in good and luck may use a schwa [ə] (best identified phonemically as /ə/, rather than a separate phoneme /ʌ/) instead of an RP-like [ʌ] in the second word, so that they pronounce good luck as /ˌɡʊd ˈlək/. The words book, cook and look are typically pronounced with GOOSE rather than that of FOOT, which is true within Northern England and the Midlands. This causes minimal pairs such as look and luck, and book and buck. The use of a long /uː/ in such words is more often used in working-class accents, however recently this feature is becoming more recessive, being less found with younger people. Some speakers exhibit the weak vowel merger, so that the unstressed /ɪ/ merges with /ə/. For those speakers, eleven and orange are pronounced /əˈlɛvən/ and /ˈɒrəndʒ/ rather than /ɪˈlɛvən/ and /ˈɒrɪndʒ/. In final position, /iː, ʉː/ tend to be somewhat diphthongal [ɪ̈i ~ ɪ̈ɪ, ɪ̈u ~ ɪ̈ʊ]. Sometimes this also happens before /l/ in words such as school [skɪ̈ʊl]. /ʉː/ is typically central [ʉː] and it may be even fronted to [yː] so that it becomes the rounded counterpart of /iː/. According to Wells (1982), they are [ɛ̈ː] and [ëː], with the former being more conservative. According to Roca & Johnson (1999), it is [ɘː]. According to Beal (2004), they are [ɛː] and [ɜː], with the latter being more conservative. According to Watson (2007), it is typically a front vowel of the [eː ~ ɛː ~ ɪː] type. According to Gimson (2014), it is [œː]. Middle class speakers may differentiate SQUARE from NURSE by using a front vowel [ɛː] for the former and a central [ɜː] for the latter, much like in RP. According to Watson (2007), it is back [ɑː], with front [aː] being a common realisation for some speakers. According to Collins & Mees (2013) and Gimson (2014), it is typically front [aː]. The NEAR vowel /iɛ/ typically has a front second element [ɛ]. The CURE vowel /uɛ/ often merges with the THOUGHT vowel /ɔː/, so that sure is often /ʃɔː/. When distinct from THOUGHT, this vowel is a diphthong [uɛ] or a disyllabic sequence [ɪuə] or [ɪwə]. The last two realisations are best interpreted phonemically as a sequence /ʉːə/. Variants other than the monophthong [ɔː] are considered to be very conservative. The FACE vowel /eɪ/ is typically diphthongal [eɪ], rather than being a monophthong [eː] that is commonly found in other Northern English accents. The GOAT vowel /ɛʉ/ has a considerable allophonic variation. Its starting point can be open-mid front [ɛ], close-mid front [e] or mid central [ə] (similarly to the NURSE vowel), whereas its ending point varies between fairly close central [ʉ̞] and a more back [ʊ]. The most typical realisation is [ɛʉ̞], but [ɛʊ, eʉ̞, eʊ, əʉ̞] and an RP-like [əʊ] are also possible. Wells (1982) also lists [oʊ] and [ɔʊ]. According to him, the [eʊ] version has a centralised starting point [ë]. This and variants similar to it sound inappropriately posh in combination with other broad Scouse vowels. Older Scouse had a contrastive FORCE vowel /oə/ which is now most commonly merged with THOUGHT/NORTH /ɔː/. The PRICE vowel /aɪ/ can be monophthongised to [äː] in certain environments. According to Wells (1982) and Watson (2007), the diphthongal realisation is quite close to the conservative RP norm ([aɪ]), but according to Collins & Mees (2013) it has a rather back starting point ([ɑɪ]). The MOUTH vowel /aʊ/ is [aʊ], close to the RP norm. NG-coalescence is not present as with other Northern English accents, for instance realising along as [əˈlɒŋɡ]. Like many other accents around the world, G-dropping also occurs, with [ən] being a substitute for [ɪŋɡ]. Debuccalisation to [h], with older speakers only doing this in function words with short vowel pre-pausally: it, lot, not, that, what, pronounced [ɪh, lɒh, nɒh, d̪ah, wɒh] respectively. On the other hand, younger speakers may further debuccalise in polysyllabic words in unstressed syllables, hence aggregate, maggot, market [ˈaɡɾɪɡɪh, ˈmaɡɪh, ˈmaːxɪh]. Word-finally and before another vowel, it is typically pronounced [ɹ] or [ɾ], which is found in several other Northern English varieties. T-glottalisation also occurs like the rest of the UK, with [ʔ] occurring before /l/ and other syllabic consonants, however rarely occurring. Affrication of /t/ as [t͡s] word-initially and lenited, variously articulated such as [θ̠~ð̠], intervocalically and word-finally. /k/ can turn into an affricate or a fricative, determined mostly by the quality of the preceding vowel. If replaced with a fricative, a voiceless velar fricative [x] or voiceless uvular fricative [χ] may be used in words like book or clock. Much rarely, /p/ can be fricatised to [ɸ]. As with other varieties of English, the voiceless plosives /p, t, k/ are aspirated word-initially, except when /s/ precedes in the same syllable. It can also occur word- and utterance-finally, with potential preaspirated pronunciations [ʰp, ʰt, ʰk] (which is often perceived as glottal noise or as oral friction produced in the same environment as the stop) for utterance-final environments, primarily found in female speakers. The voiced plosives /b, d, ɡ/ are also fricatised, with /d/ particularly being lentitioned to the same extent as /t/, although it is frequently devoiced to /t/. The dental fricatives /θ, ð/ are often realised as dental stops [t̪, d̪] under Irish influence, although the fricative forms are also found. The accent is non-rhotic, meaning /r/ is not pronounced unless followed by a vowel. When it is pronounced, it is typically realised as a tap [ɾ] particularly between vowels (mirror, very) or as a consonant cluster (breath, free, strip), and approximant [ɹ] otherwise. Nevertheless, the approximant realisation can also be seen where the tap is typically realised. Irish influences include the pronunciation of the name of the letter H with h-adding; as /heɪtʃ/, and the second person plural (you) as 'youse/yous/use' /juːz/. The use of me instead of my is also present: for example, "That's me book you got there" for "That's my book you got there". [dubious – discuss] An exception occurs when "my" is emphasised: for example, "That's my book you got there" (and not his (or hers) ). The use of 'giz' instead of 'give us'. This became famous throughout the UK through Boys from the Blackstuff in 1982. The use of the term 'made up' to portray the feeling of happiness or joy in something. For example, 'I'm made up I didn't go out last night'. The terms 'sound' and 'boss' are used in many ways. They are used as a positive adjective such as 'it was sound' meaning it was good. It is used to answer questions of our wellbeing, such as 'I'm boss' in reply to 'How are you?' The term can also be used sarcastically in negative circumstances to affirm a type of indifference such as 'I'm dumping you'. The reply 'sound' in this case translates to the sarcastic use of 'good' or to 'yeah fine', 'ok', 'I'm fine about it', 'no problem' etc. Voice of John Bishop from the BBC programme Desert Island Discs, 24 June 2012. See also: Category:People from Liverpool. Scouse is highly distinguishable from other English dialects. Because of this international recognition, on 16 September, 1996, Keith Szlamp made a request to IANA to make it a recognised Internet dialect. After citing a number of references, the application was accepted on 25 May 2000 and now allows Internet documents that use the dialect to be categorised as 'Scouse' by using the language tag "en-Scouse". Scouse has also become well known as the accent of the international rock band The Beatles. The members of the band are famously from Liverpool; however, their accent is no longer viewed as "Scouse" because of how much Scouse has changed since the "Beatlemania" period of the 1960s. Lancashire dialect and accent, which varies across the county. Cumbrian dialect, spoken largely in North and West Cumbria. ^ a b c Julie Henry (30 March 2008). "Scouse twang spreads beyond Merseyside". The Telegraph. ^ a b c "Geordie and Scouse accents on the rise as Britons 'look to protect their sense of identity'". Daily Mail. 4 January 2010. ^ a b c Nick Coligan (29 March 2008). "Scouse accent defying experts and 'evolving'". Liverpool Echo. ^ a b c d Dominic Tobin and Jonathan Leake (3 January 2010). "Regional accents thrive against the odds in Britain". The Sunday Times. ^ a b c Chris Osuh (31 March 2008). "Scouse accent on the move". Manchester Evening News. ^ a b c d Patrick Honeybone. "New-dialect formation in nineteenth century Liverpool: a brief history of Scouse" (PDF). Open House Press. ^ a b c Richard Savill (3 January 2010). "British regional accents 'still thriving'". The Telegraph. ^ John Mullan (18 June 1999). "Lost Voices". The Guardian. ^ Knowles, Gerald (1973). "2.2". Scouse: the urban dialect of Liverpool (PhD). University of Leeds. Retrieved 2 December 2017. ^ Knowles, Gerald (1973). "3.2". Scouse: the urban dialect of Liverpool (PhD). University of Leeds. Retrieved 2 December 2017. ^ a b c d e f g h i j Watson (2007), p. 358. ^ a b c d e f Watson (2007), p. 357. ^ a b Watson (2007), pp. 357–358. ^ a b c Collins & Mees (2013), p. 185. ^ a b c d Wells (1982), p. 373. ^ Gimson (2014), pp. 92, 115. ^ a b Wells (1982), pp. 361, 372. ^ a b Beal (2004), p. 125. ^ Gimson (2014), p. 125. ^ Beal (2004), p. 123. ^ a b c Wells (1982), pp. 372–373. ^ a b c d e Watson (2007), p. 352. ^ a b c d e f Watson (2007), p. 353. ^ "LANGUAGE TAG REGISTRATION FORM". IANA.org. 25 May 2000. Retrieved 25 November 2015. ^ Shaw, Frank; Spiegl, Fritz; Kelly, Stan. Lern Yerself Scouse. 1: How to Talk Proper in Liverpool. Scouse Press. ISBN 978-0901367013. ^ Lane, Linacre; Spiegl, Fritz. Lern Yerself Scouse. 2: The ABZ of Scouse. Scouse Press. ISBN 978-0901367037. ^ Minard, Brian. Lern Yerself Scouse. 3: Wersia Sensa Yuma?. Scouse Press. ISBN 978-0901367044. ^ Spiegl, Fritz; Allen, Ken. Lern Yerself Scouse. 4: The Language of Laura Norder. Scouse Press. ISBN 978-0901367310. ^ a b "CLEAN AIR CLEANING UP OLD BEATLES ACCENT". abcnews.go.com. 23 Feb 2002. Retrieved 29 December 2017. ^ Unterberger, Richie. Scouse at AllMusic. Retrieved 5 July 2013. Sound map – Accents & dialects in Accents & Dialects, British Library. BBC – Liverpool Local History – Learn to speak Scouse!